One thing that makes Maya Chan Beach different from all other beach clubs in Costa Maya, is that we include all your transportation needs for your day with us. Our guests do not have to find a specific driver, or special bus then worry they got on the wrong one. You will be under our watchful protection from the moment you leave the port to the moment you return. Transportation was something we always found challenging while on cruises and sometimes challenging can mean stressful. Why stress? You’re on vacation. Print our Getting Here Instructions Guide before your arrive. Once you disembark and make your way through the port area, an English speaking Maya Chan Representative in uniform will be waiting for you. We confirm your name on our reservations sheet and then arrange for your taxi. Because everybody won’t arrive at the meeting point at the same time, you may be asked to wait a few minutes for your ride. At no time will this wait be longer than 10-15 minutes and we always provide shade and seats. 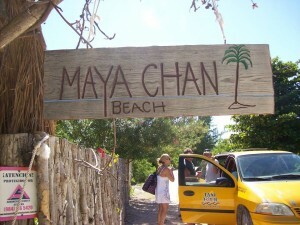 You will join other Maya Chan guests for your short, 20-30 minute ride to our location. 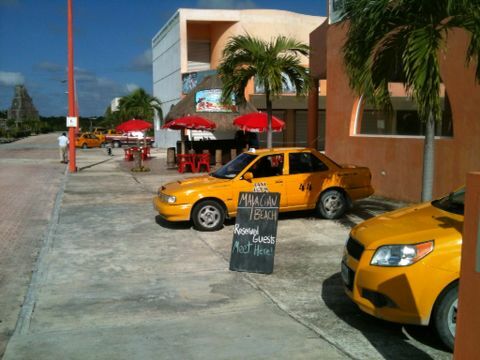 We are required to use local taxis and they will take you all the way to our beach club. You do not need to take the port transportation to town, and then find another taxi to take you the rest of the way. Your journey will take you through a housing area known locally as “the casitas”. You will next drive through the narrow streets of our busy little fishing village named Mahahaul. This is the area where port transportation drops off guests for the day. You will see many open air restaurants along the beach and many different colored umbrellas and chairs lined up for the days visitors. Locals will be waving menus at your taxi, trying to get the driver to stop and have you spend your money at “their” location. Deciding where to go might be interpreted as stressful, and who needs that? 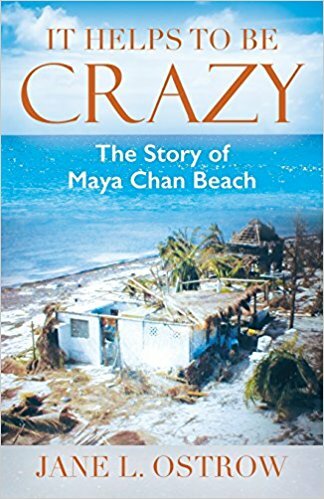 Maya Chan Beach is only 4.3 miles from the port of Costa Maya. The ride south of town is along a sandy road that is a State Highway. Public transportation buses transit this route several times a day. The government of Mexico is doing a good job lately of maintaining this road, which can become bumpy during the rainy season. Most owners south of town keep their area of the road smooth, however some others are not so inclined. Be patient. Enjoy the adventure. And enjoy driving along the Costa Maya coastline, oftentimes right on the water’s edge. At the end of your stay, we will once again arrange all your transportation needs. Shortly after lunch we will meet up with each party and ask for your preferred departure time. We always have a “Last taxi” sign in the bar area which will let you know the very last minute you can leave for your ship’s departure, and still allows plenty of time for a leisurely stroll back to the ship. There may even be a short expanse of time for shopping, if you are so inclined. We track down the taxi drivers and complete all the leg work. You just need to enjoy your day. A staff member will let you know 15-20 minutes before your taxi arrives. Then we will find you on the beach and let you know when your ride back to the ship is there and waiting. No need to stand in line. No need to walk around in the hot sun trying to flag a taxi down. No need worrying about the price and if the driver will overcharge you. We keep track of each driver, which guests go into a particular vehicle, and which vehicles are used. We know which drivers don’t want to run their A/C for passengers and which ones are informative and thoughtful. And we pass along what we know to our guests. And keep in mind that we are cruisers, too. We have heard the warnings of arriving late to your ship. We work hard to make certain this never happens at our beach resort. We always get you back with plenty of breathing room. We don’t have overnight accommodations, so it’s pretty important to us that you find your way back.